As I mentioned in my recent interview with the Vancouver Sun published today, I learned from Nobel Economists that our unsustainable economic system causes an increase in cancer, pollution and disease. It also increases loneliness -- and studies show loneliness is worse than smoking 15 cigarettes per day, and twice worse than obesity. Most people agree the system is broken. But now what? What should we do about it? It may sound naive, but I believe love and kindness is the answer! I cannot buy or sell love and kindness BUT I can give it away freely! So I decided to stop buying, selling, and trading -- and instead, I simply give and receive. I want a public debate about our economy, and our government to change our policies. I believe a "gift economy" can remove the causes of my cancer and disease, just like Okinawa Japan, Ikaria Greece, Sardinia Italy and the world's healthiest places with the highest concentration of centenarians who have gift economies! So I'd like to pay your rent as a gift, or help you pay your mortgage. She took a picture when she received it. I'd like you to meet Brice. This man is unlike any other person I've ever encountered. I've learned so much from him. But what really blew me away and melted my heart was his generosity. You see, he offered to pay my rent for an entire year! He explained that the money exchange system of buying and selling is flawed and ultimately leads to illness. We need to give and receive freely to others. Only then can we truly understand human love and compassion. He desires a society in which people take care of each other like this. And... 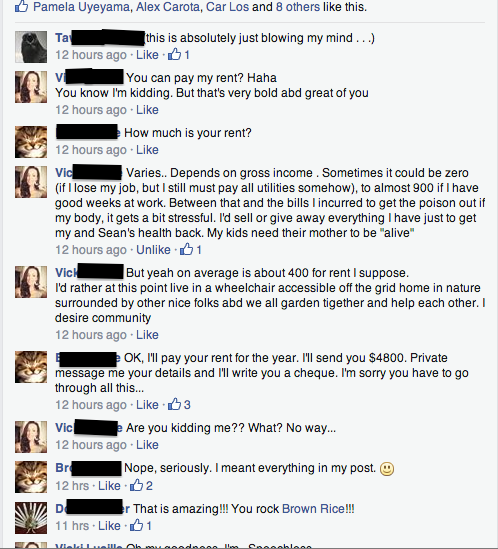 He took money out of his own personal savings to help me, a person he's never even met outside of Facebook. But then I understood his reasoning. We often will only receive what we are willing to give. The universe is like a boomerang or echo– what you send out is what you get back. So Brice is sending out waves of love to others and I'm sure he will receive just as much, if not more, love in return. It is my sincerest hope that us people in this world will see the massive effect they can have on others and their community, if they simply care for one another. I gave another person left a comment on my blog below. There are a few more that I didn't bother reporting yet. This is a big risk and cost on my part. But this may be the only way to start a discussion about our broken economic system. Sometimes, you need to take risks to change the world, like this man. Everyone should receive housing as a gift. It has nothing to do with affordability. No one should have to trade money in exchange for housing or anything. Especially if they can afford it. 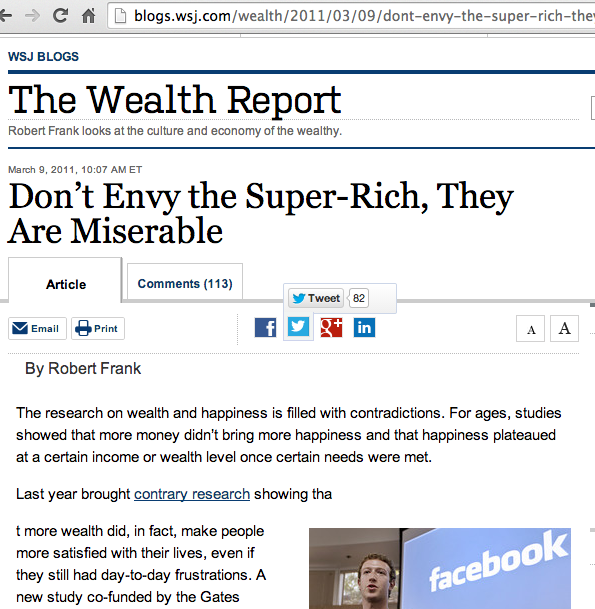 In fact, studies show the wealthier you are, the more psychologically disconnected and dependent on money you become. So the wealthiest 1% ironically need to experience giving and receiving the most. I can confirm this from family experience. "In a survey titled "Joys and Dilemma of Wealth" by Boston College, funded by the Bill & Melinda Gates Foundation and Calibre Wealth Management, the wealthiest set revealed they are an unhappy bunch -- worried about appearing ungrateful, rearing bratty children and failing to meet expectations." Would $25 million make you happy? Not if you're a member of the ultra-rich. In a survey titled "Joys and Dilemma of Wealth" by Boston College, funded by the Bill & Melinda Gates Foundation and Calibre Wealth Management, the wealthiest set revealed they are an unhappy bunch -- worried about appearing ungrateful, rearing bratty children and failing to meet expectations. A respondent reported he wouldn't feel financially secure until he had $1 billion in the bank. Survey respondents report feeling that they have lost the right to complain about anything, for fear of sounding — or being — ungrateful. Those who are parents worry that their children will become trust-fund brats if their inheritances are too large — or will be forever resentful if those inheritances (or parts of them) are instead bequeathed to charity. The respondents also confide that they feel their outside relationships have been altered by, and have in some cases become contingent on, their wealth. "Very few people know the level of my wealth, and if they did, in most cases I believe it would change our relationship," writes one respondent. Another says, "I start to wonder how many people we know would cut us off if they didn't think they could get something from us." Some wealthy people stopped looking forward to the holidays "because they were always expected to give really good presents," said Robert Kenny, one of the organizers of the survey, when interviewed in The Atlantic. When you're a millionaire, Kenny says, expensive gifts merely meet expectations. "That was a pretty good present," the recipients might say. "But last year, you gave me a car." "Wealth can be a barrier to connecting with other people," writes the spouse of a tech wizard who cashed in to the tune of $80 million. Rich people often feel they can't share the stresses in their lives, for fear someone will say, "Yeah, wouldn't I like to have your problems." It can get awkward when the check comes at a restaurant and there's hesitation over who will pay. One wealthy survey respondent who worked in the nonprofit sector says she would feel insecure about her position if she resumed working. "If I decided to get a job in the field, I think I would have trouble being seen as a colleague and not a donor," she wrote. Many express relief that their kids' education was assured, but are concerned that money might rob them of ambition. Having money "runs the danger of giving them a perverted view of the world," one respondent writes. Another worries, "Money could mess them up — give them a sense of entitlement, prevent them from developing a strong sense of empathy and compassion." "I have grown up with a father who never wanted to give up control of his business but kept taunting me with the opportunity to step into his shoes." His wife adds, "It has been difficult to feel financially independent when [my] spouse's parents hold tight control over [our] children's inheritance." "Nobody has the excuse of 'lack of money' for not being at peace and living in integrity," writes one survey respondent of his family, with a touch of bitterness. "If they choose to live otherwise, that's their business." The gift isn't the money, it's the experience of love. So when I'm offering you to pay your mortgage, taxes or rent --- the gift I'm offering you isn't just the money, it's the love -- the experience of receiving and giving. The gift I am offering you is the experience of removing transactions which isolate you from others, and leads to disease. And on the big picture, it contributes to the psychology that creates unsustainable economic conditions that harms us. What we do with money is our choice. We can buy or sell, or we can give and receive. In an ideal world, we wouldn't need money. Unfortunately, most of us don't live sustainably off-grid and are dependent in the monetary economy. But what we do with money is still our choice. We can trade and exchange money for housing and services, but that will further disconnect us, harm us, and contribute to an unsustainable economy. We can freely give and receive money, housing, and food with no strings attached. Just like we do with family and friends. That will solve many of our global crises today. The choice is ours. And I choose to give and receive! All I want is people to question this economic system based on trade, and to consider alternatives. Seeking Homeowners: I'd like to pay your tenants rent, or mortgage. I'm looking for housing but instead of buying or renting a home, I'd like to pay your next tenant's rent so they can receive free housing, or help pay off your mortgage, or property taxes. I understand this sounds unconventional. The reason why I'm doing it is because although I'm taking a risk, I believe that giving and receiving without trade is the only way I can heal myself from cancer, and save others from the disconnection that the market economy creates. If you're a homeowner interested in receiving this gift, I'd love to hear from you. PS: The short answer is we never trade with family and friends, only strangers and enemies. And this disconnection led to many of our worlds global crises. PPS: You may ask: "If you can afford a home, why not rent or buy one yourself?" Because that's a trade. Instead, I am giving you is a gift with no strings attached. I don't expect you to repay me. Otherwise, that would be an exchange, not a true gift. A real gift is about love, not trade. Of course, I cannot help everyone as much as I would love to, or I would quickly be bankrupt. Please don't take it personally if I don't answer your request. But I will do my best. But let's hope my action will get others to do the same? To read more on how I believe the gift economy will remove the causes my cancer, click here. What you are doing in your local community is amazing, and i hope the world wakes up and creates a massive ripple effect. The only way any of us can truly heal is to 'let go' of what we hang onto, and to give freely. That is what makes a good, loving community and peace within. Again, you are amazing and your kindness exceeds anything Ive ever experienced, and Ive never even had the pleasure to meet you in real life. May you continue to be blessed and bless others. I'm so happy I could help pay your rent! Please don't forget to send me your details so I can send you the cheque. I am speechless too. Brice, you gave Vicki so much inspiration and hope. She really could use a leg up and I think you have restored her faith in humanity. Thanks for your comment. I still have much to learn too. I'm only doing what I can. I'm glad Vicki will get a leg up - we all need that, including myself! I love to give and to receive. I'm hoping that I will find someone, or people, who will be able to help me find housing as well. Where do we send our story? I don't want to put something in an inappropriate place! That's awful. Your friend's story and mine are a great example and the exact reason why I am fighting for this. I want to wake everyone, so that more people can do what I'm doing. But you see -- here's the difference though, that may confuse some people. The causes of the problem isn't affordability. It's not a lack of money, but *how* we use money that makes the difference. If your friend was healthy and a had high income, she still would need a gift of free housing/rent/mortgage! If someone gifted her rent, then she could gift rent to someone else -- and that would bring much healing for her, and make her feel less isolated. P.S: That's why I'm trying to avoid buying food for myself, transportation, or housing .. BUT I'm giving it to others freely, without an exchange or trade. I receive it too, and not always from the people I give (otherwise that would be a trade/exchange). It's just like family. We don't keep count, we simply give and receive freely. When we have a surplus of something, we share it with others in need. When you buy everything you need for yourself (your own house, food, transportation, etc), then you don't need others, and you can become very psychologically maladapted -- that leads to disease. It's very common amongst wealthy children too. So again, the problem isn't always money, but it's how we use it. If we use it differently, we can really begin to change and heal this world. I could ask for the gift of free rent, but I would rather pay the rent I have and funds to give to others. I have suffered from anxiety and depression for most of my life. It is debilitating at times and it can be a struggle to care for my children while working a full time job. Thankfully my husband is amazing and supports me as best as he can. I believe I have found a cure for my mental health issues. It is nothing a doctor can prescribe. Giving. I have been collecting donations and using my own funds to create care packs for those in need. I wish it could all be done through trade and barter and I am keeping that possibility open and inviting it! As I am writing this I received an email from my work letting me know that there have been more donations delivered. I used to always say "I hate people" and now I have a renewed faith in our ability to be compassionate, kind and to heal. The exchange of energy that comes from giving is pure and natural. If you could pay my rent for 1 month, I could continue this project for at least another 2! Leanne, I am in my mid fifties and have suffered with the same anxiety attacks and clinical depression since I was 17. I raised my daughter as a single parent and have always felt even worst knowing how my mental illness has affected her life. Every time I would try getting ahead another bout of depression would hit and knock me right back to square one. After losing too many jobs for missing time no one wants to hire you any more and life gets even harder. I am now on permanent disability and barley scrape by each month. 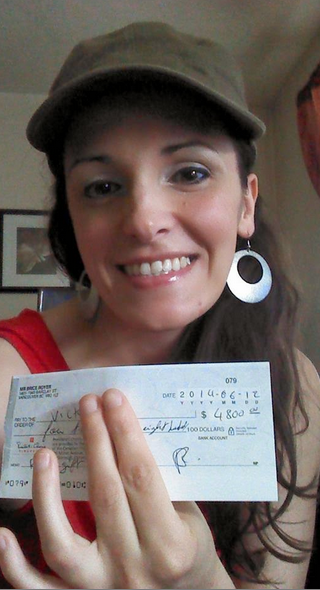 I am in Squamish and can help you with a $100 donation to put smiles on others faces. You can contact me at woodja.notask@gmail.com so we can arrange getting you the money. $795.00 a month. We are very lucky to have found a co-op here in Squamish! You only want 1 month's rent? I will give you 2 months. I'll write you a cheque for $1590. Email me your details (full name and address). Don't repay me with any exchange or trade, I will decline. :-) Just pay it forward to someone else in greater need. I admire what you are doing, have done.Pay it forward. I have had a heck of a time for the past 5 years, including cancer, death of my cat, having to move because the home we rented was sold (twice) depression and wanting to give up. I reached out and people reached back. Some financial help, mostly emotional and spiritual help. It was amazing and has changed my outlook on life. First of all, you are amazing! I can't believe what you have started! The love amd joy you are spreading is amazing! If you're stil looking to help people with rent, I would be so greatful. my hubby worka so hard to support me and my kids and with Father's Day coming up, I was thinking how great it would be to take the stress of paying our housing charge off of him for once. As I am unable to work, thia is not something I can do, though I do take care of the kiddies Anyways, our housing charge is 1016 a month, so if there's anything you could do to help me make his day, I would be forever grateful! Thanks for taking the time to read this, Brice! What is happening here is beautiful. I will think how I can best give to someone outside my circle. A month of rent relief would be amazing. My partner has struggled to find decent work after we tried to start a family business that ended with my mother disowning me for reasons that I still can't understand. We are both epileptic and this makes it harder. Our rent is $1500. I would really only ask for my partner's half to be covered though. I do have work. I don't know what I can do to find you free housing yet that would be chemical free and safe for your condition but either way, I will still be keeping an ear to the ground for you. I joined the FB group yesterday (I'm going honey Mae a camera! Yay) and I love this concept. I hope it spreads far and wide. I'll start off by saying how amazing and inspiring you are to so many people. This is such a great thing you are doing for people and how you are changing the way people think. To do such nice things for people you don't even know is amazing. It inspires me as im sure it inspires everyone you meet. I would like to nominate a family that could really use some help with their rent. They just moved from Kitimat to down here to try and find more work but they are struggling. They have a 2 year old boy and found out they are expecting another baby. They had to leave pretty much everything behind when they moved here so they don't have anything for the baby they are expecting. They pay $800 a month for rent and if you were able to help them out they would be able to get back on their feet and get everything they will need for the new baby. They are such sweet people and help out others whenever they can. Thanks so much for considering them. You truly are a guardian angel! I tried to post this morning but I guess it didn't work. Maybe a sign? You are amazing. I have always tried to live my life giving to others and teaching my son the importance of random acts of kindness. I hope he is starting to get it! I am a single mom of the most amazing boy with autism. I also deal with my own mental and physical health issues including PTSD. Life has not been easy and I don't have much but I believe that it important to pass on the gift of hope to others. I have recently suffered some financial sets backs. It was hard to make ends meet before this but now it is just impossible. I am looking at having to uproot my son and move. It is hard enough for me to think about but for a child that can't handle change... well you can imagine. I have had to reduce my work hours by 9 per week and have lost almost half of the child support I receive. I try to remain positive but it can be hard. I have been to the dark place of not wanting to go many times and thankfully have found my way back from the edge. My greatest fear is that I will be there again and not find my way back. 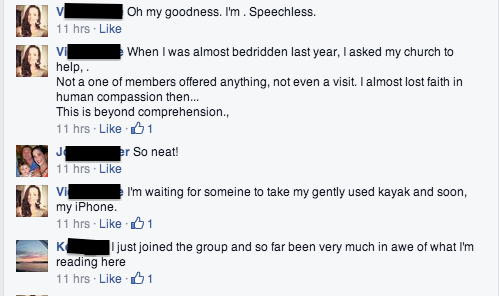 I am embarrassed and afraid to ask, I am not worthy of such kindness. A months rent would make a huge difference in my life at this time. A chance to not stress for that month and time to come up with a game plan. The ability to make sure my Zoom has new shoes and to stock up the freezer. I have been criticized for not selling my things or taking my son's clothes to consignment. I know financially it might help but I believe that there is greater good to help someone who may need it and not be able to afford it. Regardless, I will continue to live as I do, helping those when I can. Regardless of how small, I will by a stranger a coffee or pay for a meal and give away the furniture I no longer want or need. I will be the person I want to be and so, I want to thank you for inspiring me to keep going and be true to myself and my beliefs. 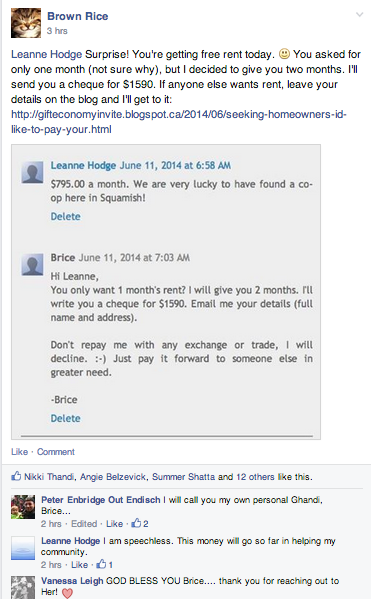 Dear Brice, I know there are people that need their rent paid more then I do. I mange to get by each month and have not needed the food bank for almost a year now (for that I am grateful as it leaves more for the kids that are in need). If you or some one reading this can find it in your heart to pay two months of my rent at $575 per month I would be able to go see my daughter and grandchild in Winnipeg this summer. I haven't seen them in 6 years now and miss them. And for that I would be ever so grateful.